From the beginning, the whimsical, yet elegant, clothes have been made of natural fabrics (mostly cotton) and artfully adorned with sumptuous appliques' (many with jewel and stud embellishments). Women have flocked to her shops in Sedona, Sanibel Island, LaJolla and Hilton Head. Retail stores like Neiman Marcus, and Nordstroms, and numerous boutiques around the country clamored to feature her unique designs. After years of frenzied activity to meet the relentless demands, and wanting to devote time to other interests (raising horses and traveling), Ava closed her shops, leaving open only one in Cottonwood, Arizona and concentrated on trunk shows where she unpacked her trunks in Arizona, California, New Mexico, Nevada, Washington and Oregon. 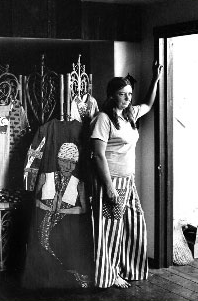 In 2006 she moved her shop from Cottonwood to Camp Verde, Arizona. In 2008 Ava closed her Camp Verde retail store. Since then Alfredo's Wife separates, dresses, jackets, ponchos and caftans are available either on this website or at her seasonal Trunk Shows. Ava's designs are available in XXXSmall to X-Large and Plus Sizes 1X to 3X. They are very generously cut so it may be that you take a size or two smaller with us than you would anywhere else. Click "What's My Size" above before you order to assure proper fit. Well...that just about covers the last 50 years of creating some unique art to wear. Go ahead and visit our "Clothing Gallery" above and start adding to your wardrobe of casual, resort and cruise wear.